This week Jimmy and Mindy are joined by Caitlin 'The Grass-fed Girl' Weeks and Justin Bently, the host of Real Food Science on YouTube. Don't miss this great episode, brought to you by our friends at Skogg Kettlebell System! 24: Badier 'Lazy Caveman' Velji & Sally Krumdiack on Pediatric Diabetes and More! 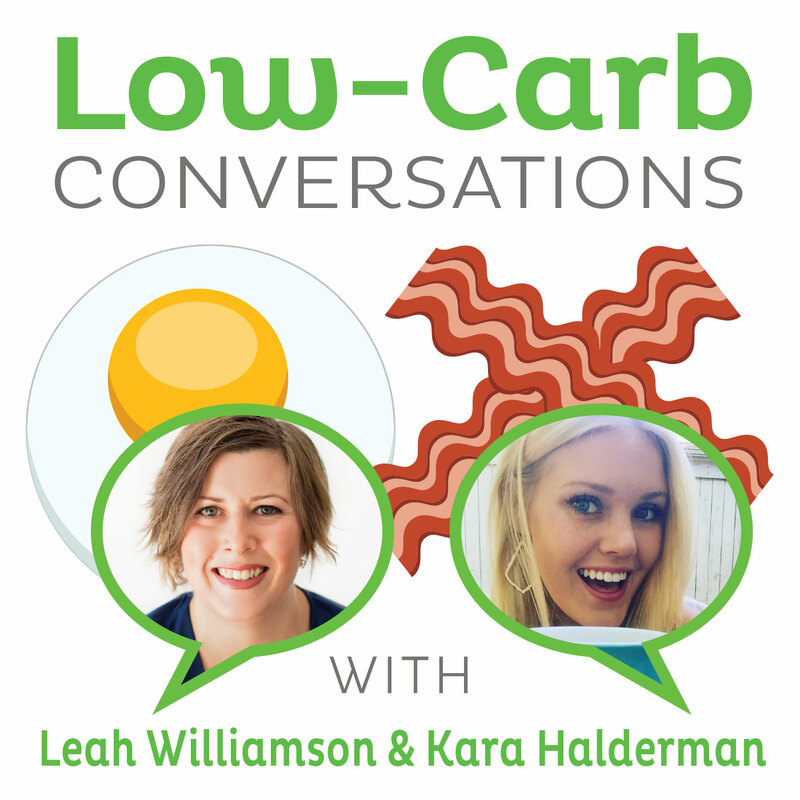 Welcome back for another great episode of Low-Carb Conversations With Jimmy Moore and Friends! Today Jimmy and Mindy are joined by Paleo blogger Badier Velji and MMA athlete Sally Krumdiack. They talk about recent developments in the battle against Childhood Obesity and a great recipe for spaghetti squash with meat sauce. So go grab a cup of coffe, pull up a chair and join us on the Virtual Porch for some great low-carb chin wagging! - "Michelle Obama, Olive Garden, Red Lobster vow healthier kids' meals"
- "A Nation of Little Fatties"
Poke a number of holes into the spaghetti squash with a fork to release pressure while cooking. Put the squash in the microwave for 15 minutes, rotating every 3. At the same time, brown the ground beef on medium in a skillet with 3 tbsp of coconut oil. When the beef is halfway done, add the cumin, pepper, salt and oregano. Finish browning the beef, turn the heat to low, and add the jar of salsa. Let this simmer for an additional 5-10 minutes until it thickens. When the spaghetti squash is done, remove it from the microwave (carefully, it will be hot). Slice off the end caps and cut in half length wise. With a fork, remove the seeds and fibers from the center. Again with a fork, scrape the remaining squash into a new container. Here, you can choose to continue cooking the squash in the microwave with additional oil for 15 more minutes, or pan fry it. The consistency should be soft with a slight crunch to it. When done, the beef can be served on the bed of squash or mixed together, either hot or cold. Today Jimmy and Mindy welcome Joe Lindley and Pam Howell to episode 23 of Low-Carb Conversations with Jimmy Moore and Friends! - Stephan Guyenet's "The Carbohydrate Hypothesis of Obesity: a Critical Examination"
Since this recipe is nothing but meat (and rub) it is low carb. I use an electric smoker to get the smoke flavor and also to produce a flavorful “bark” (blackened outside surface) that provides a great deal of flavor. Since briskets come in 8 to 12 lb. sizes, this makes enough meat for several meals. Portions can be easily frozen for use later on. Low Carb BBQ Brisket (Smoked Beef Brisket) prepared in a Smoker and double-cooked to provide tasty Burnt Ends. This recipe provides tender sliced BBQ beef and chopped BBQ beef. A smoker is used in this example, however an oven or roaster oven can be used with liquid smoke to obtain the smoky flavor. The oven approach won’t provide as much of the “bark” outer surface characteristic of smoked beef. Remove the Brisket from the smoker and remove the “flat” (Video 2) for refrigeration/freezing and use later. Remove the fat cap from the smoker, remove meat from it (see video), and chop it up. Combine all of the chopped fat cap (burnt ends) with some of the flat (chopped) and spice very lightly with the optional spices of your choice to produce chopped BBQ beef. A suggestion is to save half of the flat for slicing and use as a more formal sliced BBQ entree. The chopped BBQ from this is spicy enough that, to serve as an entree, it can just be sprinkled with olive oil, reheated in a microwave, and served as is. Check the “trim” of the brisket: Sometimes the fat on both sides is completely trimmed off, which is NOT what you want. You want a brisket that has one lean side with the fat trimmed off (called the flat) and one fatty side that has fat over the entire length of the brisket. On the fatty side there should be a thick knot of fat at one end, sometimes intermingled with meat, called the “fat cap”. Plan ahead: The brisket will be in the smoker for a long time – two long stretches. You don’t want to end up messing with it in the middle of the night. For briskets, 2 hours or so of smoke is about right, so after you’ve finished the smoke phase, you may, if you prefer, transfer the brisket to a preheated oven or roaster oven for the remainder of the cook time, wrapped in aluminum foil in a deep pan to catch the juices. Barbara Rose and Dean Dwyer join Jimmy and Mindy on today's installment of Low-Carb Conversations With Jimmy Moore and Friends! - "You Can't Fix A Body You Hate"
- Times Union column "Be Cautious When Cutting Back On Carbs"
We’re baaaaaaaack! After taking the month of August off for a much-needed summer break, Jimmy and Mindy are back in the saddle once again ready to chat about and discuss healthy low-carb living. Be sure you pull up a chair, grab a cup of coffee and join us on the Virtual Porch to talk with our “friends” this week Lisa Geiger and Sandy Personette in Episode 21 of Low-Carb Conversations with Jimmy Moore & Friends! Today we talk about Mindy’s summer weight loss challenge and how it led her and her husband to try a unique form of kettlebell lifting, low-carbing for acne control, a salad in a jar recipe, and a tasty recipe for a no-tortilla enchilada bake! The conversation has begun against and we appreciate you listening and being a part of the fun. Special thanks to our brand new sponsor: Skogg Kettlebell System!